This spiked black backpack is probably more punk than goth. But maybe you could make it fit in with your existing cyber industrial wardrobe. This monster backpack isn't for everybody, but I am getting a kick out of it. This black and red shoulderbag is made to look like a pirate wench or Victorian trollop's lacings. 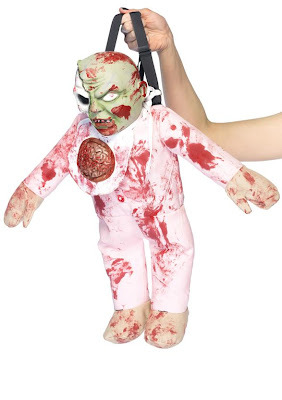 I have to admit, this zombie baby backpack is too gross even for me. This zombie brains backpack is horrifically colorful. This backpack has cute hearses all over it, in orange, purple and green. 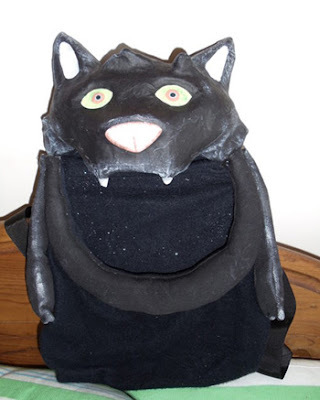 The same seller also offers a similar style Frankenstein horror backpack. I guess this doctor's bag style hearse satchel wouldn't be good for toting around big heavy textbooks. But if you just need to run around with your netbook, Nook or Kindle, a wallet and a few cosmetics, you'd be good to go. This seller also offers a similar satchel in a Frankenstein horror fabric. This "Bones" backpack glows in the dark. That's so cool! This zombie backpack glows in the dark too. This vampire lips satchel is rather hideous, but it does make a statement! Here's a cute bat packpack. Let's just call it a "batpack!" It's actually made to hold Halloween treats, not school supplies. The same seller also offers a ghoul treat backpack. 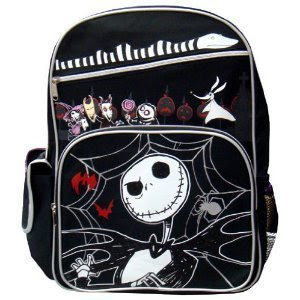 You really can't go wrong with a Nightmare Before Christmas backpack. You'll enjoy seeing Jack Skellington's smiling face looking at you every time you reach for a book. This cute gargoyle backpack is from Hot Topic. Why do skulls always have to be grinning, like the one on this skull backpack? I wouldn't mind seeing one growling or looking angry with its mouth closed. I so want to add the skeleton backpack to my collection!